The etiology of anterior knee pain is multifactorial and not well defined due to the variety of symptoms, pain location and pain level experienced by the patient. Underlying factors could be patella abnormalities, muscular imbalances or weakness leading to patella malalignment on flexion and extension. The can cause include overuse injuries such as; tendinopathy, insertional tendinopathy, patellar instability, chondral and steochondral damage . Evaluation of anterior pain is challenging as it can be non specific and differential diagnosis is extensive. It requires a thorough examination, symptom history, an indepth knowledge of the associated structures and typical injury patterns. In younger individuals an assessment of their general growth and development is also essential to determine a diagnosis. Hip and lumbar spine disorders can refer to the knee and need to be excluded. Symptoms: Pain (location and type) or instability problems? Patellar position: Patella alta? Patella baja? Patellar glide? Patellar tilt? Patellar rotation? Muscles and soft tissues: Hypotrophy of VMO? Imbalance between VM and VL? Weakness of knee extensors, hip flexors and/or hip abductors? Tightness of the medial retinaculum? Tightness of lateral muscle structures, hamstrings and/or rectus femoris? Knee function (pain and/or maltracking of the patella): During different dynamic activities, e.g. stair walking, step-up/step-down exercises and one-leg squat? The 13 item screening Kujala Anterior Knee Pain Scale (AKPS) can also be used to identify patellofemoral pain in adolescents and young adults. Ittenbach et all suggest that is highly reliable, but not without its limitations and further research is needed for its use outside of a clinical environment and application to the general population. The AKPS has shown to have good test-retest reliability. The Kujala anterior knee pain scale and the Lower extremity functional scale can be used for both an initial screening tool as well as to detect changes with treatment and as outcome measures. For long term non-operative results, any postural mal-alignment or altered movement patterns should be addressing initially before introducing a strengthening programme. When assessing functional abnormality and compensatory patterns the whole lower limb should be observed, not restricting assessment to the knee area. Any significant leg length discrepancy should be addressed as well any intrinsic imbalances in the foot where these are contributing factors. Eng et all suggest that orthotics alongside exercise can result in more effective outcomes for sufferers of anterior knee pain compared to exercise alone , but any exercise and/or stretching programme needs to be individualised relative to the presenting symptoms and the movement dysfunction. Level of evidence: 1B. Where the retinaculum is tight, affecting the patellofemoral joint, manual stretching or McConnell taping may improve symptoms. But taping alone does not significantly reduce pain. However, there is evidence that knee taping, including placebo-taping, combined with exercice provides superior reduction in pain compared with exercice alone. Therapies such as proprioceptive training, shoe inserts and taping may be best utilized as a complement to traditional exercice therapy; however, they have not been effective when implemented alone. Level of evidence: 1A. With an exercise programme, improving the eccentric muscular control is more effective than concentric exercises, with closed chain exercises being more functional and minimising stress on the patellofemoral joint. Reduced knee extensor strength is commonly seen in anterior knee pain patients, as well as weakness in the vastus medialus obliqus (VMO), although Witvrouw et al concluded that the VMO can not be worked in isolation, VMO designed exercises activating both VM and VL. A neuromuscular dysfunction is thought to be the cause of a VMO deficit. Level of evidence 1A. Muscle length in the hamstrings, gastrocnemius and Rectus femoris all effect patellofemoral mechanics. Tight hamstrings can generate an increased reaction force over the patellofemoral joint as a greater force is required by the quadriceps for movement, so regular stretching is advised. But according to Mason et al, who compared the effectiveness of quadriceps stretching, quadriceps strengthening and taping in isolation and in combination, quadriceps stretching and quadriceps strengthening resulted in isolation in more improvements than taping. They also concluded that combining these treatments is recommended as the initial approach to treating patellofemoral pain but further individualized more functional, global treatment is essential. Level of evidence: 1B. 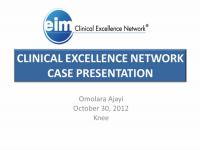 This presentation was created by Omolara Ajayi in collaboration with: EIM Clinical Excellence Network and Physical Therapy Central. 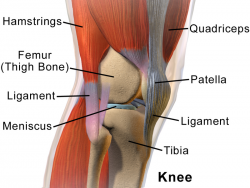 Anterior knee pain is a symptom, not a diagnosis. Any diagnosis for the pain is essentially via exclusion due to the numerous possible conditions, where patella abnormailty or muscular imbalances are important factors, determined by a thorough history and patient examination.There is also a high correlation between AKP and faulty hip mechanics, so any assessment needs to involve the entire kinetic chain. Treatment is highly individualised and the European Rehabilitation Panel's guideline is a useful tool for choosing a non-operative treatment protocol. ↑ Sala D, Silvestre A, Gomar-Sancho F. Intraosseous hyperpressure of the patella as a cause of anterior knee pain. Medscape Orth Sports Med. 1999;3:1–8. ↑ Helfenstein M Jr, Kuromoto J. Anserine syndrome. Rev Bras Reumatol. 2010;50(3):313-327. ↑ Suzanne Werner, Anterior knee pain: an update of physical therapy, Knee Surg Sports Traumatol Artrosc (2014) 22:2286-2294. ↑ 7.0 7.1 7.2 Witvrouw E, Werner S, Mikkelsen C, Van Tiggelen D, Berghe Vanden L, Cerulli G: Clinical classification of patellofemoral pain syndrome: guidelines for non-operative treatment. Knee Surg Sports Traumatol Arthrosc. 2005, 13 (2): 122-130. ↑ Houghton KM. Review for the generalist: evaluation of anterior knee pain. Pediatric Rheumatology Online Journal. 2007;5:8. doi:10.1186/1546-0096-5-8. ↑ Kujala UM, Jaakkola LH, Koskinen SK, Taimela S, Hurme M, Nelimarkka O. Scoring of patellofemoral disorders. Arthroscopy: the journal of arthroscopic & related surgery: official publication of the Arthroscopy Association of North America and the International Arthroscopy Association. 1993;9(2):159–63. Epub 1993/01/01. ↑ Ittenbach RF, Huang G, Barber Foss KD, Hewett TE, Myer GD. Reliability and Validity of the Anterior Knee Pain Scale: Applications for Use as an Epidemiologic Screener. Rudan J, ed. PLoS ONE. 2016;11(7):e0159204. doi:10.1371/journal.pone.0159204. ↑ Cynthia j. Watson et al. ,Reliability and Responsiveness of the Lower Extremity Functional Scale and the Anterior Knee Pain Scale in Patients With Anterior Knee Pain. Journal of Orthopaedic and Sport Physical Therapy 2005. ↑ Catherine A. Logan, MD, MBA, MSPT,* Abhiram R. Bhashyam, MD, Ashley J. Tisosky, MD, Daniel B. Haber, MD, and Matthew T. Provencher, CAPT, MT, MD, MC, USNR. Systematic Review of the effect of Taping Techniques on Patellofemoral Pain Syndrome. Sports Health. 2017 Sep/Oct;9(5):456-461.https://doi.org/10.1177/1941738117710938 (accessed 15 June 2017).